The Rand Water Water Wise Garden is designed to comprise many different, mainly indigenous plants, grouped according to their water requirements. They are mulched regularly and watered with a drip irrigation system. No pesticides are used and companion planting reduces the need for artificial controls. Water is a scarce resource and must be used efficiently and wisely. A water-wise garden will become a wise investment, which will result in reduced maintenance, long-term sustainability, and a sense of personal well-being. 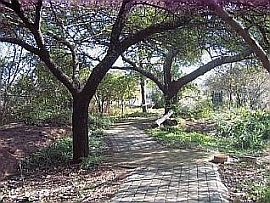 The garden is situated at the entrance of, and now forms part of, the SASOL Sensory Trail in Delta Park. The garden was designed in accordance with educational requirements for environmental and experiential learning. The water-wise garden caters for everyone, with special facilities for the blind, elderly and physically challenged. People in wheelchairs are only able to view and experience the garden from the main central pathway. Blind people would need to be led through the garden as the sleeper bridge and the mulch dividers require some negotiating. The sides of the garden are elevated with mounded soil to make the interaction for touch easier for those who can’t bend down to floor level. 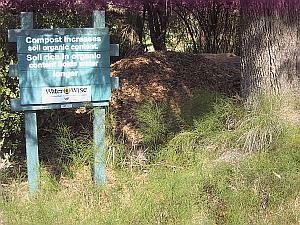 The forest effect on the mound provides screening from the roadway and parking area and heightens curiosity about what is behind the forest and adds extra charm to the garden. The much-needed microclimate for protection from the cold winter will be an added bonus as the forest traps warm air and prevents it from moving up the hillside away from the garden. Currently heavy frosts are experienced because the site is very exposed. It is interesting to note that the residential areas outside the park do not encounter the same severity of cold damage in their gardens, possibly due to high walls and large plants. The dense growth will also help encourage wildlife to the garden. Wildlife is the underlying theme of the garden with plenty of butterflies and other insects always buzzing above the flowers. Surface water from the garden is captured when runoff moving down the hill above the garden is slowed down over the level concrete path and then directed by means of a stone-packed dry river bed to a collection area. Moisture-loving plants have been situated below the collection area to benefit from this slow release of moisture into the soil. The collection area is treated with bentonite to slow down the infiltration of water into the soil. The stone packed watercourse is planted with summer flowering bulbs which help trap silt before going into the collection area. In winter the path becomes more prominent, appearing as a dry riverbed. This demonstrates how dormant features (bulbs) can be made attractive during winter months. Zoning for overall water saving is the grouping of plants with similar water requirements according to zones (hydro zoning). Plants can then be watered according to their own water requirements, which does not waste water. So often, large areas of gardens are watered because of just a few plants needing watering. Focal points are important in any good garden design and a large emphasis is placed on them in water-wise gardens to direct movement through the garden and to maximize the efficiency of each of the hydro zones. The high water zones are concentrated at focal areas of the garden. (Resting spots on the sleeper platform and the bench under the shady roof.) Annuals are included for extra variety, some of which are planted in containers for added water efficiency. The medium zones are made up of hardy shrubs, perennials and ground covers, which can tolerate water rationing should it be required. Plants in this zone will form the backbone of the garden. The low water zones are areas of non-watered lawns and areas of grey succulents (Mesembryanthemums, better known as Vygies). A large Aloe bansii forms a prominent focal point in this zone.